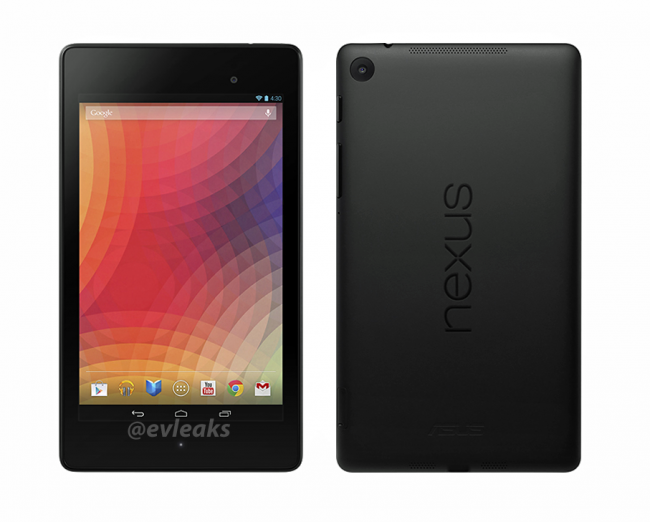 And that right there, would be your official new Nexus 7 press render, courtesy of @evleaks. The device was first leaked last week, along with most of its specs and potential launch dates through retailers, but this is the cleanest look yet at Google’s new 7-inch tablet. As you can see – and would expect – it runs stock Android, has front and rear cameras, vertically placed Nexus logo on the back, lower-chin notification light, top and bottom speakers, plus a headphone jack up top. In terms of display and bezel, I wouldn’t say that this new version has any less bezel than last year’s model, but the screen resolution is expected to be bumped up significantly. You’ll notice that the time on the clock reads 4:30, which used to be a dead giveaway for the version of Android that the device was running. But over the last few weeks, as Android 4.3 launch dates have slipped and devices carrying the 4:30 time in their press render clocks are still running 4.2.2, that’s no longer a given. Then again, we are expecting to see this new tablet and Android 4.3 at an event in San Francisco on Wednesday, so this one could be accurate. Specs will likely go as follows: 1.5GHz Snapdragon S4 Pro quad-core processor, 7-inch FHD display (1920×1200), 5MP rear camera, 1.2MP front camera, 16GB or 32GB of storage, no microSD slot, wireless charging, a SlimPort, WiFi and LTE radios (notice the SIM slot, lower-left), and whatever the newest version of Android is, which will be 4.3. The 16GB model is rumored to priced at $229, with the 32GB model dropping in at $269.